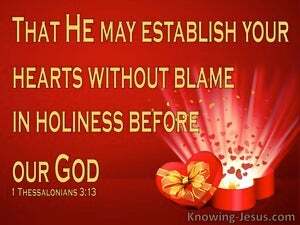 ﻿ 1 Thessalonians 3:13 so that He may establish your hearts without blame in holiness before our God and Father at the coming of our Lord Jesus with all His saints. 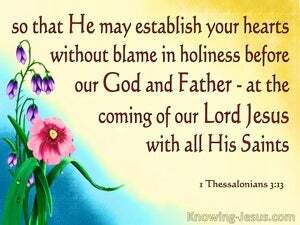 in order to establish your hearts unblameable in holiness before our God and Father at the coming of our Lord Jesus with all his sanctified. So that He may strengthen and confirm and establish your hearts faultlessly pure and unblamable in holiness in the sight of our God and Father, at the coming of our Lord Jesus Christ (the Messiah) with all His saints (the holy and glorified people of God)! Amen, (so be it)! May the Lord strengthen your hearts so you will be [found] without just blame and holy, in the presence of our God and Father, when our Lord Jesus Christ returns with all of His holy ones [i.e., angels. See Mark 8:38; II Thess. 1:7]. in order that he may establish your hearts blameless in holiness, in the presence of our God and Father, at the coming of our Lord Jesus Christ with all his saints. So that your hearts may be strong and free from all sin before our God and Father, at the coming of our Lord Jesus with all his saints. so that he may establish your hearts without blame in holiness before our God and Father, at the coming of our Lord Jesus with all his saints. that by the sanctity of your affections, you may stand unreprov'd in the presence of God our father, when our Lord Jesus Christ shall come with all his holy angels. in order to establish your hearts blameless in holiness in the presence of God even our Father, at the coming of our Lord Jesus with all his saints: amen. so that your hearts may be strong and faultlessly pure in the sight of our God and Father, when our Lord Jesus appears with all his saints! That he may establish your hearts unblameable in holiness (before our God and Father, at the coming of our Lord Jesus Christ) with all his saints. that your hearts may be confirmed in holiness, irreprehensible before God, even our Father, for the coming of our Lord Jesus Christ with all his saints. To make your hearts firm, complete in holiness before God, and our Father, in the arrival of our Lord Jesus Christ with all his holy ones. 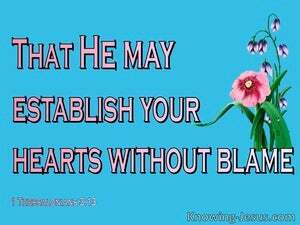 so that your hearts may be established blameless in holiness before our God and Father at the coming of our Lord Jesus with all his saints. in order to establish your hearts blameless in holiness before God, even our Father, at the coming of our Lord Jesus Christ with all His saints. to make your hearts that they might be stable and unblamable in holiness before God our father, at the coming of our Lord Jesus Christ, with all his saints. And so may he establish your hearts unblameable in holiness before our God and Father, at the coming of our Lord Jesus, with all his saints. so that your hearts are strengthened in holiness to be blameless before our God and Father at the coming of our Lord Jesus with all his saints. in order that he may establish your hearts unblamable in holiness before God, our Father, at the coming of our Lord Jesus with all his holy ones. to confirm your hearts without blame in holiness before God, even our Father, at the coming of our Lord Jesus with all his saints. To the end he may confirms your hearts, faultless in holiness, before our God and Father, in the Presence of our Lord Jesus with all his saints. to the end that your hearts may be established blameless in holiness before God and our Father, at the coming of our Lord Jesus Christ with all his saints. And so make your hearts strong, and your lives pure beyond reproach, in the sight of our God and Father, at the Coming of our Lord Jesus, with all his Holy Ones. Thus He will build up your characters, so that you will be faultlessly holy in the presence of our God and Father at the Coming of our Lord Jesus with all His holy ones. so that He may strengthen your hearts to be faultless in purity in the sight of God, when our Lord Jesus comes back with all His consecrated ones. to the end that He may establish your hearts unblamable in holiness before our God and Father, at the coming of our Lord Jesus with all His saints. that your hearts may be established unblameable in holiness, before God even our Father, at the coming of our Lord Jesus Christ, with all his saints.